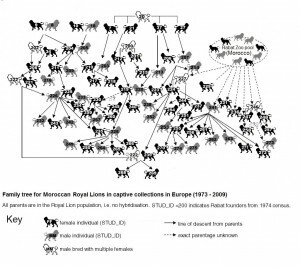 A recent paper on improving conservation decision making (Black, 2015) includes some of the data used in developing the Moroccan Royal Lion studbook (Black, Yamaguchi, Harland and Groombridge, 2010) as previously gathered by the author with Dr Nobuyuki Yamaguchi (University of Qatar) and Adrian Harland (Aspinall – Port Lympne Wild Animal Park). Data on productivity (in this case, the number of cubs born) shows that since the initiative to revisit and re-catalogue the lions known to be direct descendents of the King of Morocco’s collection there has been a marked increase in the production of new cubs. The great news is that these are also form well-matched pairs with no further in-breeding. However the analysis also shows that a greater level of breeding is still needed to bring the natural regeneration of the population under control. Currently there are practical restrictions to achieving this since clearly there are limits to the capacity that zoos have for increasing lion group sizes and for controlling breeding behaviour. This entry was posted in Conservation, Zoo Research and tagged captivity, Moroccan Royal lions on December 7, 2015 by Simon Black. 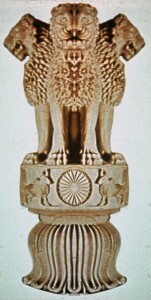 Was the lion ever native to India? In 2013 a book was published by Valmik Thapar which presented the idea that both the cheetah and the lion were most probably non-native species in India, introduced as captive animals from Africa or Central Asia, trained or used for Royal entertainment in the many substantial parks across the subcontinent and, with the demise of the various imperial and local royal dynasties between the 1200s and the mid 20th century, feral animals had become established as wild populations, hence the species now being seen as native (and rare – the lion, or extinct -the cheetah). 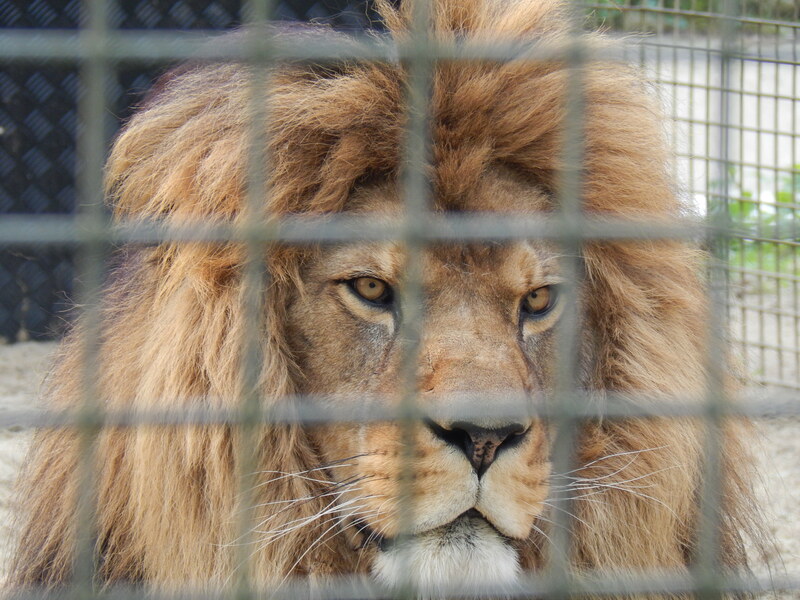 The genetics of captive Asiatic Lions (in the USA) shows traits of African subspecies. Do we understand the genetics of Indian lions relative to (and as different from) African lions? See recent work by Barnett et al. (2014). Are all Asiatic lions Asiatic-African hybrids? This was the case in American Zoo animals in the 1980s – but those zoos may have mismanaged Asiatic-African pairings in captivity earlier in the 20th century. What are the conservation implications? Should Asiatic lions still be conserved? – YES – even if they are non-native to India, they are the last remnants of the lions which once ranged from Egypt to India (i.e. to the banks of the Indus river). Might Indian lions be close relatives of Barbary Lions? – This is an intriguing possibility (see Barnett et al. 2014). 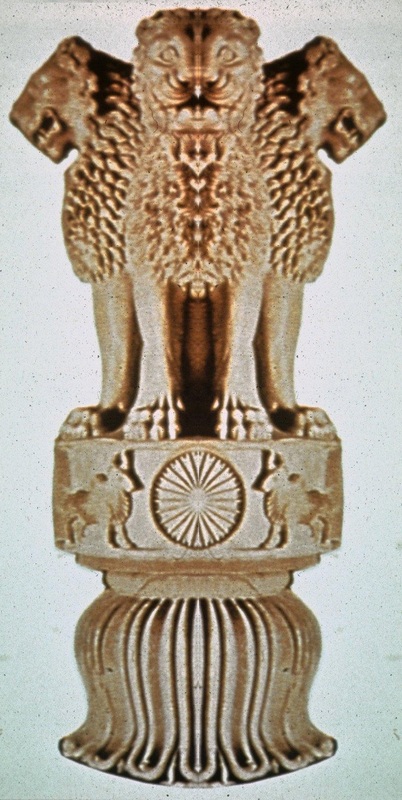 What about an Indian – Moroccan Royal lions Hybrid? – if Indian lions are ‘tame’ (which is NOT the case with many captive Moroccan Royal lions), then you could out-breed ‘tameness’ and retain an authentic the asiatic (northern) subspecies of lion. Similalry Asiatic lioins could eb used to retain or ‘clean up’ the Moroccan lions if they are wshown to be Barbary/subSaharan hybrids. There is little reason to accept Thapar’s hypotheses. Improvements in genetic analysis will enable us to better understand lion phylogeny in due course. In the meantime, precaution suggests continued efforts in Indian lion conservation are strongly recommended. Thapar V., Thapar R., and Ansari Y. (2013) Exotic Aliens: the lion and cheetah in India. Aleph, India. This entry was posted in Conservation, Genetics, Zoo Research and tagged India, lion on October 5, 2015 by Simon Black. 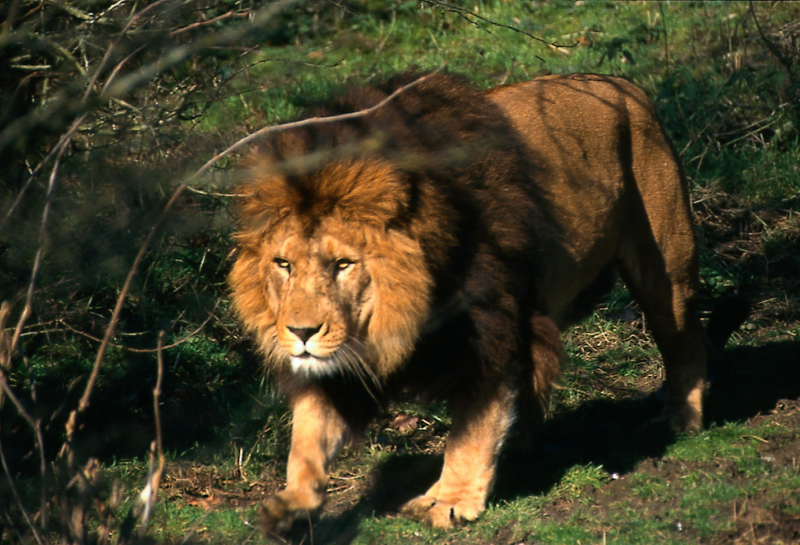 By the end of the 1990s efforts by several zoos to engage in a pan-European breeding programme for lions derived from the King of Morocco’s collection was beginning to fade. Only Port Lympne continued with an active breeding group, and a male from Rabat zoo (number 241 on the diagram opposite) was brought in to reinvigorate a pride which was developed from animals imported from Washington zoo in the 1980s. Up until that point they had reached a point of inbreeding within a family group. Moroccan heritage in zoos worldwide. Aside from the animals in Rabat Zoo (Morocco), all the other descendents were is zoos in Europe, plus two animals in Israel. However there had been no transfers since the early 2000s and those which had occurred had not given rise to new cubs. The family tree derived from this work allowed potentially suitable (unrelated) pairs to be identified and for breeding transfers to be arranged by interested zoos. This has enabled reinvigoration of the zoo stock. 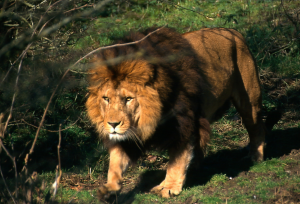 In the early 200os nearly a quarter of Moroccan Royal lions in European zoos were related to Suliman, the male at Port Lympne (photo: N. Yamaguchi). This entry was posted in Conservation, Zoo Research and tagged Moroccan Royal lions on May 22, 2015 by Simon Black. The barbary lion is extinct in the wild, most probably since the early 1960s. Up until that fairly recent time the Sultans of Morocco, followed by the Kings of Morocco after constitutional changes in the 1950s, kept lions in private menageries. These animals had been bred from cubs which were presented as tributes by Berber Tribes of the Atlas Mountains. In the late 1960s the remaining lions were still in the King of Morocco’s lion garden at the palace of Fez, then later Rabat. 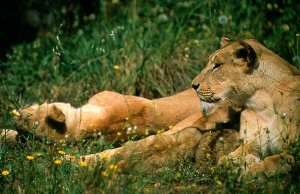 After an outbreak of respiratrory disease in the collection in the late 1960s, the lions were then moved to a new purpose built zoo in Rabat in 1973 (Yamaguchi and Haddane, 2002). The importance of this is that since that first transfer of animals, it has been possible to trace all lions of pure ancestry alive today back to their ancestors – these animals originally in the Moroocan Royal palace collection. This means that zoos holding these descendents have a unique opportunity to keep the bloodline pure, and alive. Efforts by a number of zoos in recent years (Port Lympne, Olomouc, Belfast, Hannover, Madrid) to make breeding transfers and to increase the number of cubs has enabled the population to recover. As recently as 2008 it looked like breeding of these animals was likely to cease and at least one unique bloodline from the original 27 animals moved from the Royal Palace to Rabat zoo was lost at this time when an old non-breeding female in Germany died. 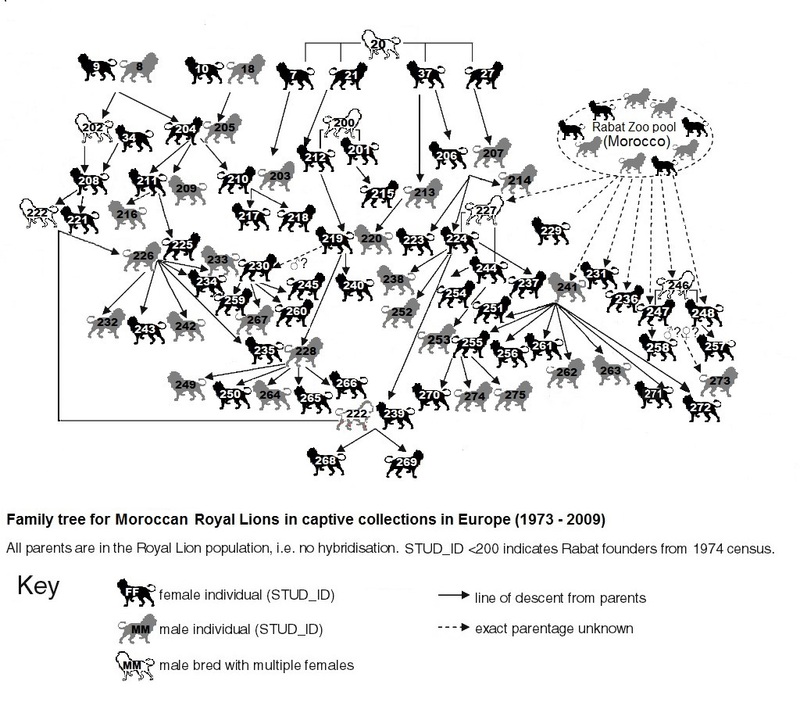 A rejuvinated zoo population with active, well managed transfers of animals between collectiosn will geive enough time for deeper scinetific and genetic analysis to determine the uniqueness and deeper ancestry of these Moroccan animals and their significance to lion conservation. This entry was posted in Conservation, Genetics, Zoo Research and tagged lion, Moroccan Royal lions, zoo on November 22, 2014 by Simon Black. During the 1990s Port Lympne in Kent (UK) was one of the few zoos with a breeding group outside Morocco. Suliman (left) was sourced from Rabat zoo and at one stage was the sire to about a quarter of the total population of animals outside Europe. He is now retired from the breeding programme. Two of Suliman’s sons are important breeding animals. One has since been transferred to Zoo Hannover (Chalid) to join a group of females. The remaining brother Milo (left) is now intended as the prime breeding male at Port Lympne. His current partner is a lioness sourced from Madrid zoo. Several females have been imported from Morocco into European zoos over the past decade. The focus of zoo-based breeding is to preserve important bloodlines represented by various animals across several zoos. Active arrangements for transfers of animals have been revived over recent years. This entry was posted in Zoo Research on July 10, 2014 by Simon Black.